Adam also has that striking vulnerability young Harrison Ford had, even when he was playing swaggering/macho/cynical men. I've rewatched Blade Runner recently and that quality really shone through in some scenes and immediately made me think of Adam. "I can get the map from the girl, I just need your guidance." WhatGirl wrote: "I can get the map from the girl, I just need your guidance." I don't know, man. 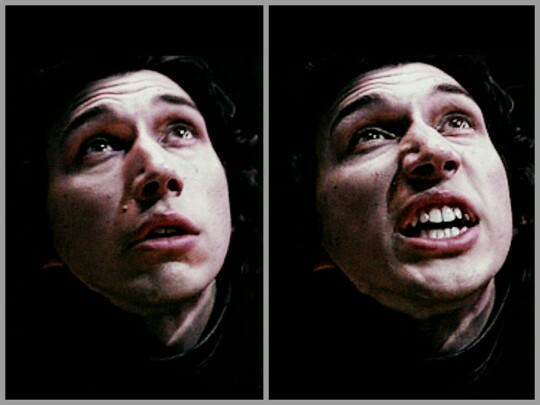 The up-the-nostrils shot of Kylo doesn't quite do it for me. This is probably the ONLY shot in the film where he looks less than attractive. I don't think it's a coincidence this takes place when he's in audience with Snoke. @IoJovi He doesn't have the confident Solo swagger here for sure, but I think he looks cute. And yeah, he looks totally different in front of Snoke than when he's with Rey. WhatGirl wrote: @IoJovi He doesn't have the confident Solo swagger here for sure, but I think he looks cute. And yeah, he looks totally different in front of Snoke than when he's with Rey. I can't get over how young Adam looks in some of these shots. Kylo following Rey through the snowy forest. Could just be a blink. Or could be a SPOILER! "Ren believed [the droid] was no longer valuable to us..."
"...that the girl was all we needed." "It is you," Ren murmured. WhatGirl wrote: Could just be a blink. Or could be a SPOILER! @Sylvia Snow That will absolutely be me as well! Second one down you can practically see how uncomfortable he is when Hux sees him without his mask on. 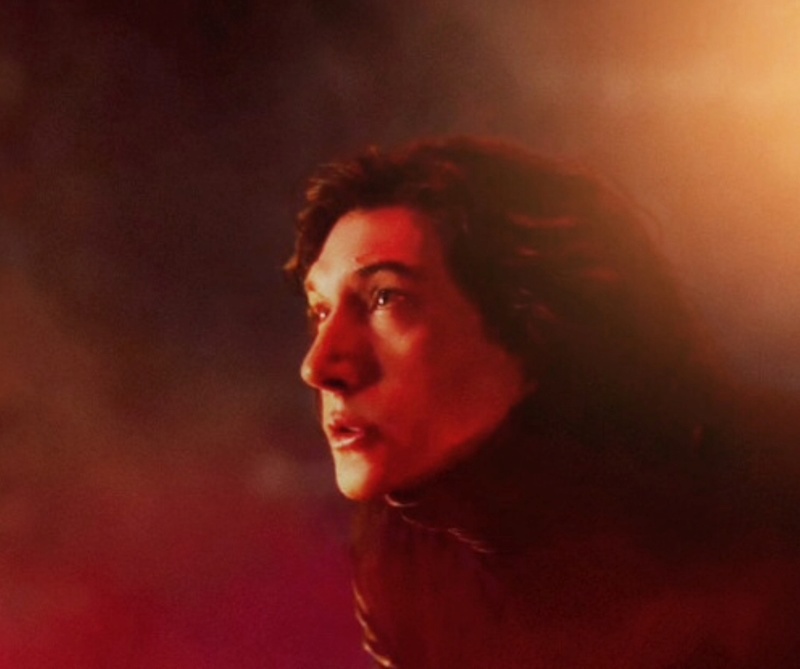 I can't help but think the two of them are set up as opposites - Kylo the (possibly) abducted child, brainwashed and abused into being Snoke's puppet, Hux the illegitimate child of Empire, not so much abused as entranced with a dream of obtaining what he'd always wanted - respect and admiration, a position of authority. I wonder if he's actually envious of Kylo's background as a child of heroes, the son of royalty, having what he'd always craved from birth. We are led to believe Kylo was 'seduced' but what if it actually was Hux who was seduced - a nobody with delusions of grandeur suddenly promised with glory, while Kylo is actually a victim, stolen and tortured into being what he is. Because if so, they will truly end up on opposite sides. Was I the only one shouting "Not the face, Rey! Not the face!"? This image is wonderful in so many ways. 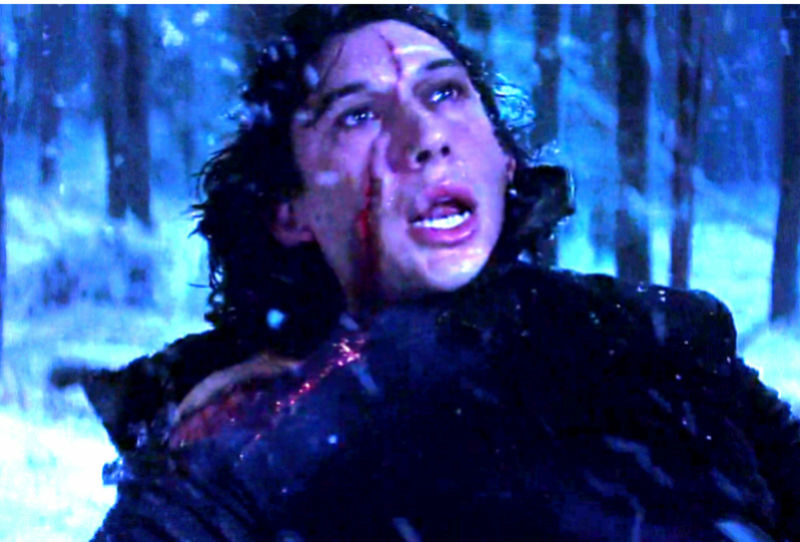 He's a mess-- he's just killed his father, he's horrified by what he's done and probably also horrified that it hasn't extinguished the call to the light, he looks up and sees that Rey and Finn have just witnessed this moment-- the red lighting, the red and black juxtaposition, the upward glance-- for this moment, he's a tortured soul in Hell longing to get free. Then in the next moment, he snarls at them, and all the beauty in his face in this scene disappears-- and he becomes a demon who belongs there. It doesn't even look like the same person. It's literary and religious and romantic (small r and capital R) all at once. Just amazing. Yeah, those two pics really demonstrate how Rey's entrance into Kylo's life directly led to his deconstruction in TFA. I know it's been said so many times before (and it's one of the main reasons this forum exists), but their dynamic is one of the most interesting (if not THE most interesting) aspects of this trilogy. It's the "villain" defeated and damaged by the "hero" in their first interactions instead of the other way around. It's one of the main reasons why I think their dynamic is going to be more unique and complicated than your run-of-the-mill hero/villain. True, their dynamic is so unique, you can hardly find any other relationship between two characters that similar to the relationship of Kylo and Rey in movies. Kylo at the end is totally different from the Kylo at the beginning of the movie. Rey completely changes him, turn his world upside down, for the better. Opposite with what happened to his grandfather, a girl has pushed Anakin Skywalker toward infinite darkness. And now his grandson is sharing the same fate but this time, a girl will come and pull him back . It would be a waste if the producers did not explore their relationship since it have so much potential and can make the plot lines become more fascinating. "Forgive me. I feel it again..."
"...the pull to the light." 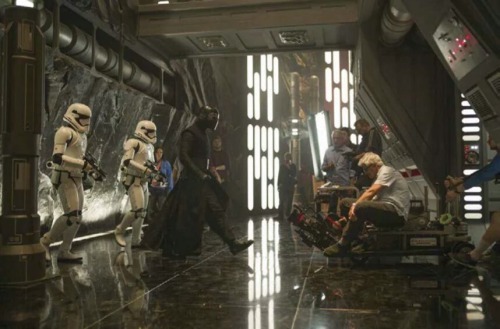 @Darth Rowan Wasn't it you who said the bts footage convinced you Kylo was definitely a love interest because they went through the trouble of braiding his hair? 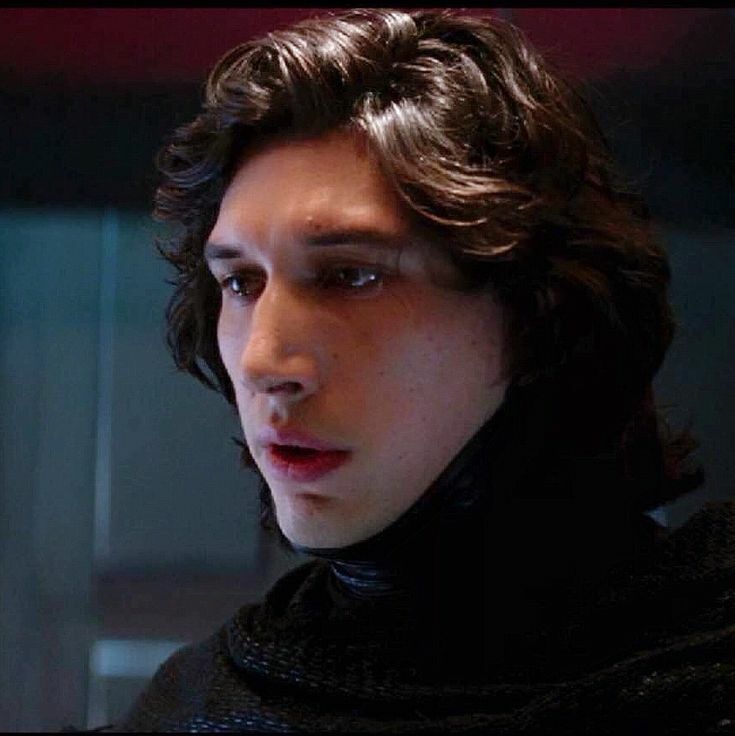 @BastilaBey wrote: @Darth Rowan Wasn't it you who said the bts footage convinced you Kylo was definitely a love interest because they went through the trouble of braiding his hair?